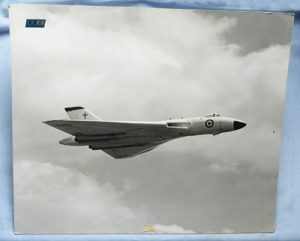 Avro Vulcan bomber – large black and white factory issued photograph. Original and scarce large black and white factory issued photograph of an Avro Vulcan bomber. With official Armstrong Siddeley factory label to the front. Dimensions are 21 inches x 17.75 inches. Good condition.